A goal is a specific target, an end result or something to be desired. It is a major step in achieving the vision of the organisation. In the strategic planning context a goal is a place where the organisation wants to be, in other words a destination. For example, a goal for a sporting organisation might be to have 50 qualified and active coaches. An organisation may set several goals that will outline a path to achieving the vision. The goal of attaining 50 qualified and active coaches will be an important step in achieving the vision of becoming most dynamic, most respected and best achieved club in the district league. Club Development To attain 30 clubs, each properly constituted. Administration To achieve a standards of administration that are commensurate with the association's vision. A measure of change in order to bring about the achievement of the goal. 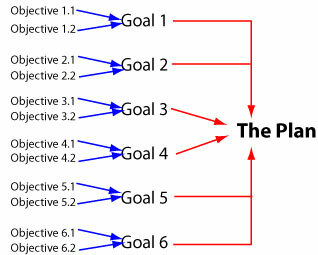 The attainment of each goal may require a number of objectives to be reached (see figure below). There is often much confusion between goals and objectives. Whereas as a goal is a description of a destination, an objective is a measure of the progress that is needed to get to the destination. The following table serves to illustrate the difference between goals and objectives. It is important to understand that a number of goals must be attained before the strategic plan can be achieved. Similarly, each goal in the strategic plan will in turn require a number of objectives to be successfully achieved. The figure opposite is a simple illustration showing that each of six goals has two objectives. In reality, the number of objectives needed for each goal can be anything but the usual range is 1 to 6. The table below also shows how a number of objectives (in this case four) is needed for a goal to attain 1000 members. An important principle in formulating objectives is that they should be specific, measurable, achievable and have time lines associated. Words like increase and reduce indicate change. Are you still confused about the difference between goals, objectives and strategies? Do you need a template for a Strategic Plan that will save you hours of work?